A bovid is any member of almost 140 species of ungulates (hoofed mammals) belonging to the family Bovidae. 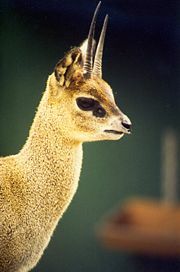 The bovids are the largest family of hoofed mammals and are native to Africa, Europe, Asia, and North America. Members include antelope, bison, buffalo, cattle, sheep, and goats. Bovids have mutually beneficial symbiotic relationships (mutualism) with bacteria and other microorganisms that allows the digestion of cellulose, the most abundant form of living terrestrial biomass, but one that is indigestible for many animals, including humans. Harmonious mutualistic relationships also exist with some birds, such as the cattle egret. Some bovids, notably cattle, sheep, and goats, have been domesticated and these domesticated species have increased their numbers worldwide. On the other hand, overhunting and other anthropogenic activities have resulted in threats to many bovids, including extinction of aurochs and some bison species. The largest bovids, for instance the bison and the gaur, can weigh over 1,000 kg (2,200 lbs) and stand 2 meters (6.5 feet) tall at the shoulder; the smallest weigh about 3 kg (7 lbs) and stand no taller than a large domestic cat. Bovids are members of the Artiodactyla (even-toed ungulate) order. As such, they walk on the third and fourth toes of each foot, which are covered and protected by hoofs—specialized claws. Standing on the toes has the effect of lengthening the legs, which gives them greater quickness and speed in running and jumping and lets them hold their heads higher above the ground to better watch out for predators (Huffman 2007). In general, bovids are herbivorous, eating plants; a few are omnivorous and eat small animals, carrion, and insects as well as plants. All bovids are ruminants, which means that they have a four-chambered stomach that allows them to digest foods that are too low in available nutriments for many other animals, notably grasses and the leaves of trees and bushes. No animal is able to directly digest cellulose, the material of plant cell walls; ruminants rely on their symbiotic relationship with bacteria and other microorganisms in their first stomach, called the rumen, to break down cellulose by fermentation. Klipspringer, Oreotragus oreotragus, one of the smaller bovids. Because of the size and weight of their complex digestive systems, many bovids have a solid, stocky build; the more gracile (slender) members of the family tend to have more selective diets, and tend to be browsers (prefer higher-level plants) rather than grazers. The fermentation taking place in the rumen generates heat and can help the animal keep warm in cold weather (Lott 2002). Bovids have large molars for chewing their food. They have no upper incisors or canine teeth and the lower incisors and canines project forward so that the plant materials they eat are torn off rather than bitten. Food is eaten quickly and later on regurgitated from the rumen back into the mouth so it can be chewed; this is known as rumination, or chewing the cud. In all bovid species, males have horns on their heads, while some females also have horns. A bovid horn consists of a bony protrusion covered in a sheath of keratin, a material found in skin, hair, and claws. Some other hoofed animals also have horns, but they differ from bovid horns. Deer, the second largest ungulate family, have antlers, which are solid bone and are shed and regrown each year. The pronghorn of North America differs from bovids by shedding the keratin sheaths of its horns each year. The horns of giraffes are bumps of cartilage covered by skin. The horns of rhinoceroses are formed of compacted hair. Gaur, Bos gaurus, one of the largest bovids. The horns of some bovid species are used to fight, and sometimes kill, predators such as wolves and lions. However, in most species the main use of the horns is in fighting between males for dominance and the right to mate with females. In many species, the horns of the males are curved or spiraled, which reduces the danger in these conflicts. Often dominance is established merely by the size of one animal's horns without a fight having to take place. The horns of males are also thought to be attractive to females by showing the good health and maturity of their bearer. Some bovids use their horns to dig for food or to pull down tree branches to eat the leaves (Voelker 1986). Horns can also help an animal keep cool in hot weather since blood is circulated through them and can shed heat by radiation (Rath 1998). Almost all bovids are social animals and live in groups, called herds or flocks. Groups can range in size from small family groups to herds of many thousands, or even millions in species such as the wildebeest and the American bison. In many species, herds migrate seasonally to find food or better climatic conditions. Smaller groups are often lead by a mature animal, either male or female. 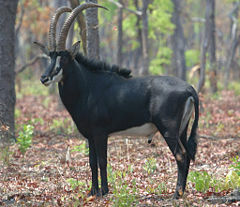 Bovid species are found in a great variety of habitats including forests, grasslands, deserts, mountains, and tundras. As major consumers of plants, they play a vital role in the ecosystems in which they live. Their constant grazing and browsing helps keep forest floors open and helps prevent grasslands from being overrun by brush. They help plants reproduce by passing their seeds through their digestive systems and they fertilize the soil with their manure. Bovids are an important food source for many species of predators, parasites, and scavengers. Other animals benefit from symbiotic relationships which them, for instance birds such as the cowbird and the cattle egret prey on insects and other small animals startled by grazing bovids. The birds in turn can help the bovids by alerting them to predators. A pair of yaks plowing in Tibet. Bovids were hunted by humans from very early times and provided them with an important food source. Many species of bovids have become extinct due to overhunting, including the aurochs, the ancestor of domestic cattle, and some species of North American bison, which are thought to have been hunted to extinction by early Native Americans. Today a number of bovid species are in danger because of hunting and habitat loss (IUCN 2007). Sheep and goats were among the first animals to be domesticated. They were followed by cattle and water buffalo. Each of these species now numbers in the tens of millions and together they provide much of the human food supply through their meat and milk. Sheep and goats also provide wool for clothing. In many countries, cattle and water buffalo still play an important role as work animals to pull carts and draw plows. The yak, the banteng, and the gayal, all close relatives of cattle, were also domesticated in Asia. Some other bovid species are now in the process of domestication, or at least being considered as potential future domestic animals; these include the muskox, the eland, and the American bison (Huffman 2007; Lott 2002). A shofar made from the horn of a kudu. Since prehistoric times, bovids have been depicted in art and have played important roles in mythology and religion. The American bison is seen to have great spiritual importance by many Native Americans. Cattle have played an important part in many cultural and religious traditions, as they continue to do in Hinduism today. In Judaism, Islam, and Christianity, sheep and goats have symbolic roles. In Judaism, a shofer, a "trumpet" made from the horn of a ram or sometimes that of a goat or antelope, is sounded at Rosh Hashanah, the celebration of the new year (Slifkin 2006). In Christianity, it is believed that the sounding of a shofer will announce the return of Christ. Huffman, B. 2007. The Ultimate Ungulate Page. Retrieved February 1, 2007. IUCN Species Survival Commission (IUCN). 2007. 2006 ICUN Red List of Threatened Species. International Union for Conservation of Nature and Natural Resources. Retrieved February 3, 2007. Lott, D. F. 2002. American Bison. Berkeley: University of California Press. Slifkin, N. 2006. Exotic Shofars. Zoo Torah. Retrieved February 8, 2007. This page was last modified on 3 April 2008, at 18:35.